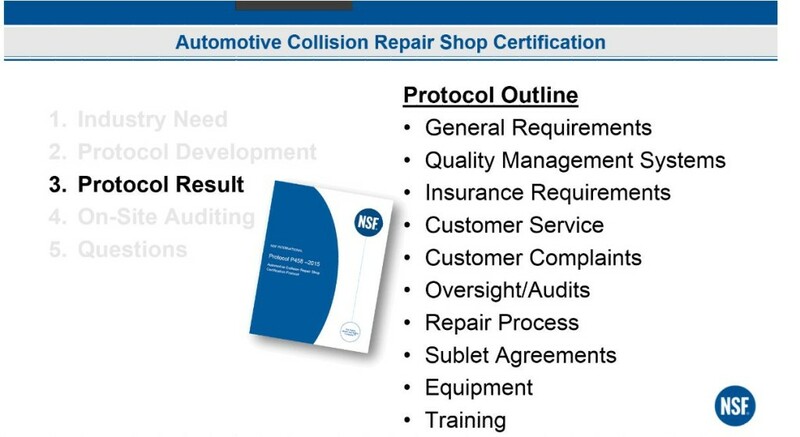 Equipment must meet OEM specifications and structural repairers must follow OEM procedures during quarterly random audits for a shop to qualify for NSF International’s new body shop certification program, the organization and auditor AccuracyDriven4 said Tuesday. The decision to allow a brand-agnostic equipment option for certifying shops was a controversial one full of “strong” emotion for the panel developing NSF’s certification protocol. “This was a difficult choice,” Lee said. The body included Lee; KerenOr Consultants principal Karen Fierst; Scott Krohn, executive vice president of operations for ABRA; AudaWatch Vice President of Strategic Accounts Garry Nelson; Roger Wright, founder of Vector Squared; International Paintless Dent Repair Chief Operating Officer Nick Notte; Automotive Body Parts Association President Jim Smith; and Fix Auto Highlands Ranch supervisor Dan Stander, who is also a Automotive Service Association board member. NSF will require a certain baseline set of equipment for each of the four levels of certification: structural, cosmetic (no welding or suspension damage), aluminum structural and aluminum cosmetic. Structural certification includes cosmetic certification, Lee said Tuesday. During the actual repairs observed in an audit, any shop with a different tool than the exact brand recommended by the OEM for a particular repair must still meet all the specifications of that brand for the shop to keep NSF-certified. “It’s holistic,” AccuracyDriven4 owner Doug Irish said on the call. On a related note, Lee clarified that NSF wouldn’t require a shop preferring OEM parts on a particular repair to use NSF-certified parts, and vice versa. The audit schedule itself — three audits before certification and quarterly random audits following it — was done so NSF could ensure it was confident a shop could actually perform the work, according to Lee. “We feel that we can’t get that in less than three audits,” he said. NSF will check that every technician performing work has a training pedigree that traces back to I-CAR or a similar training body. While each tech doesn’t need to have personally achieved I-CAR Platinum, they have to have been trained by someone who has (and this chain documented) and then perform the work correctly following OEM guidelines. Neither NSF nor AccuracyDriven4’s auditors will provide training or consulting. Lee said this was done to preserve independence and to keep the program scope narrow. However, Irish said auditors would tell a shop which areas were lacking so the shop could improve by the next of the three visits. Following OEM procedures to the letter can potentially add more to a repair bill, but insurers are interested in the program, according to Lee. He said NSF has spoken to “many of the top 25,” and they have been curious to know more. Lee said OEM certification didn’t necessarily translate to NSF certification, and vice versa. “The NSF certification is designed to be for the whole industry,” he said. However, a shop which had obtained the training and equipment for OEM certification likely would be able to satisfy those aspects of NSF’s requirements, according to Lee. Though it wouldn’t publicly post its protocol “for competitive purposes,” NSF will make its protocol available to shops who email autocert@nsf.org. Whether a shop’s technicians could actually translate those factors into a proper repair would of course still depend on their performance during the NSF audits. Asked if consumers would find another certification programs confusing, Lee stressed that NSF didn’t see the program as “competition directly” with others already on the market. However, he and Irish also indicated it would fill a critical need. 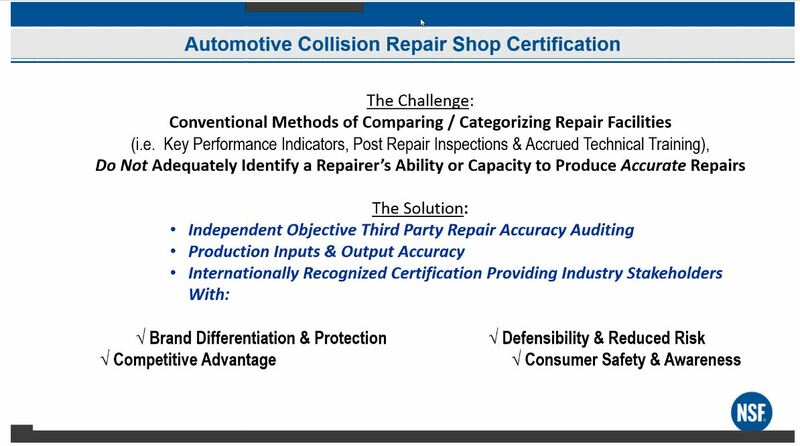 Irish argued that the usual metrics like key performance indicators, post-repair inspections and training history weren’t enough to display that a repairer could do accurate repairs. 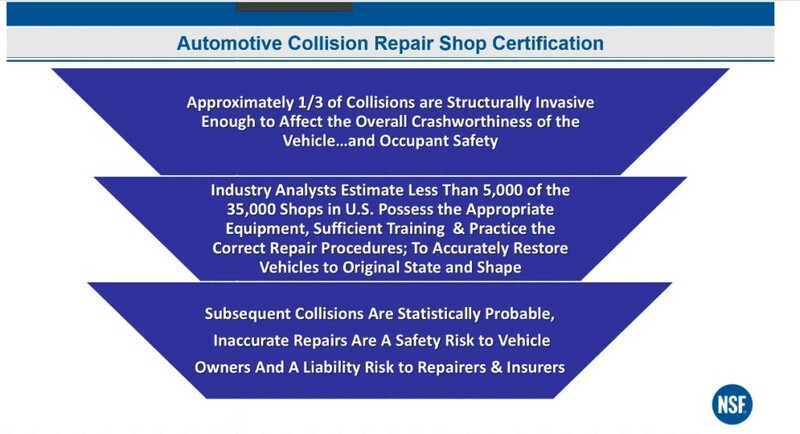 Lee presented data that a third of collisions are structurally invasive enough to affect crashworthiness and safety, and noted the sobering estimate that fewer than 5,000 of the nation’s 35,000 shops had the equipment, training and practice to truly achieve pre-loss conditions. Given that the odds were in favor of the same vehicle getting in another crash, shops and insurers were risking liability with bad repairs. Correction: A prior version of this article incorrectly identified Doug Irish, owner of AccuracyDriven4.